If you were on Twitter yesterday, you might have seen that the British Science Fiction Association (BSFA) announced the finalists of the 2018 BSFA Awards. I have a thing for science fiction awards, I am always looking forward seeing the various shortlists, my favorite awards to follow are the Clarke, the BSFA and the Kitchies. You might already know about my Clarke Award project: I’ve been reading and reviewing all the books nominated for the past three years and seeing this year’s finalists, I’m thinking on doing the same with the BSFA nominees! The various winners will be announced during Eastercon which is taking place at the end of April, it’s not that far away so I will only focus on two categories: Best Shorter Fiction and Best Novel. I also won’t put too much pressure on myself to read everything before the announcement, I’ll do my best but we’ll see how much I manage to read. Anyway, enough rambling, here are the works nominated in the categories I’m planning on reading, I’m excited about all of them (the ones I’ve read I absolutely loved!). If you want to check out the other categories (Best Non Fiction and Best Artwork, you can go on the BSFA website). I’m definitely impressed by this list, out of the five books, I have already read two of them: Revenant Gun and Rosewater and I loved them both. I was already planning on reading the other three books (I already owned them all!) and the fact that they’re all finalists is the push I needed to pick them up sooner rather than later. I’m very excited about all of them especially Europe at Dawn which is the conclusion to one of my favorite series ever! (I haven’t picked it up because I’m a terrible reader but I’m pretty sure I’m going to love it). In this category, I have only read a single story The Gift of Angels: an Introduction by Nina Allan but I absolutely adored it. I already reviewed it in my last Short Fiction Sunday post and I was extremely happy to see it on the list. Out of the nominees, I already owned Time Was by Ian McDonald and Exit Strategy by Martha Wells and after seeing this wonderful list, I bought the two NewCon Press novellas and the collection of short story Lost Objects in order to read Kingfisher. It means that I’m only missing the Malcolm Devlin story which appeared on Interzone! (But I will remedy to that soon hehe). Here are the four short stories I liked the most in January, at first I wanted to combine my short fiction favorites of January and February but it was too long so I’ll do another SFS next week with my February picks! I chose to only review a few stories to be more thorough and really explain why I liked them so much. I have full reviews of the issues mentionned available on Goodreads if you want to read my thoughts on all the stories. The Gift of Angels is set in a future version of Paris and follows a writer as he tries to learn more about his mother. She was one of the first astronauts who died on a mission to Mars and it deeply affected his life. He follows her steps in Paris as he visits places she once went to. Paris was the city his parents met and fell in love and the writer tries to imagine what their encounters were like as he goes from museums to museums and streets to cafés. I really admire Nina Allan, she’s a great writer so I’m always looking forward to her stories. I’m also a bit biased because I studied and lived in Paris. I love this city and reading about streets and places I used to go to was both nostalgic and heartwarming. I also liked the focus Allan’s made on art in this novella, several paintings and movies are at the heart of this story and it made me enjoy it even more. It’s a slow story but it’s a beautiful one. It’s my second favorite story of the issue, the title of the story is a bit misleading because I was expecting a war story or a military one set on Mars but it’s actually a very quiet story. It follows the crew of a spaceship studying samples from Mars and how their group dynamic is shattered when they learn about the illness of their leader. It’s a poignant and sad little story and it left me in tears at the end. I read other stories by Ashby and I enjoyed them as well but this one is the best I read by her so far. I really need to check her longer works. If you want to read another review of that story, I highly recommend Maddalena’s review over at Space & Sorcery! A young girl with a bad reputation enters a magic school where she hopes to start over. However, it doesn’t happen when she’s betrayed by people she trusted and she’s now on the street trying to keep her inner demon in her body while protecting a little boy. I love Carey’s longer epic fantasy works but it was the first time I tried her short fiction. I really liked Suzie Q, my favorite aspect of the story was seeing how the events of the story influenced Suzanne’s character arc. The pacing and the writing were excellent and the ending was very satisfying. What would happen if men were pregnant? You might think that you have read this story a million time over but I can assure you Beamon’s take on this trope is pretty original and worth your time. In this story, men are expecting alien babies according a contract binding aliens with humans. In exchange for advanced tech, a couple of chosen men bear alien babies. This story follows a pregnant man and the meetings he has with a support group of other pregnant men. At first, it’s hilarious but the tone gets more and more serious as we learn about the implications of those pregnancies and how they affect the chosen men. Belisarius is a Homo Quantus, a man genetically modified to manipulate data on the quantum level. He was supposed to become a great scientist like all the others of his kind, however, he doesn’t like to follow the rules. He especially doesn’t want his whole career and life to be dictated by his genes, thank you very much. What can you do with your life when you can compute data more efficiently than a computer? For Belisarius, the answer is simple: become the best con man of the universe. However, even for him, his last job might be too hard if not impossible. He has to find a way to move a huge fleet of warships across an heavily guarded black hole while remaining unseen. His client, a small vassal-state of the Congregate, is dreaming of independence and is ready to start an interstellar war for it. To succeed, Belisarius will have to pull off the biggest heist of the galaxy and he cannot do it alone. He needs a crew and a talented one at that. Who could be better than the craziest representant of other subspecies, an AI who thinks he is the reincarnation of a Saint and another Homo Quantus? At worse, they’ll kill each other off, at best, they’ll be richer than they’ll ever be! 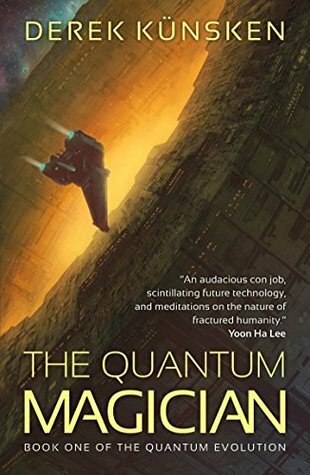 Set in a future where humans have modified their genes in order to survive in hostile environments, to improve their skills or to turn other species into their slaves, The Quantum Magician is one crazy ride. Derek Künsken has enough ideas to write dozens of books but he uses them all in one. It’s a crazy imaginative story which managed to pick my interest from page one. It’s thought-provoking, very clever and extremely enjoyable. When I finished a chapter, my immediate thought was “Okay, just another one” and it doesn’t happen that often for me. The worldbuilding is amazing, this book is packed with fascinating ideas and I had a blast discovering how humanity evolved by discovering all the new subspecies. I was morbidly fascinated by the Numens who modified their DNA in order to enslave the Puppets and how horrible it turned out for them. Belisarius is very interested by those modifications and how much it redefines the meaning of being human. Being a member of a subspecy himself, he cannot help but to question where his own actions are coming from. Is he motivated by his own free will or are his actions predetermined by his genes? This naturalistic approach of life is at the center of the book and some characters even discuss it at various points in the book. Don’t worry, it never turns into a boring lecture,on the contrary, it allows us to understand the motivation of both protagonists and antagonists. The Quantum Magician is a fabulous debut, it would make the most fantastic movie. It has everything and more, it seriously needs to be read by way more people. Highly, highly recommended. I wasn’t planning on doing a monthly segment dedicated to new releases but I had too many books on my list to write a single post so… here we are. My selection isn’t trying to be comprehensive, I haven’t even mentioned all the books I’m intrigued about and I’m sure I missed a number of other great ones. However, I love gushing about new shiny books and I thought it would be a great opportunity to do so! It’s not a February TBR by any means though I wish I could read all of them asap! The City in the Middle of the Night—Charlie Jane Anders (February 12, Tor Books)Set on a planet that has fully definitive, never-changing zones of day and night, with ensuing extreme climates of endless, frigid darkness and blinding, relentless light, humankind has somehow continued apace — though the perils outside the built cities are rife with danger as much as the streets below. I’m not gonna lie, I didn’t even had to read the synopsis to know I wanted to read this book. I really liked All The Birds in the Sky and that’s enough for me to check out this new book by Charlie Jane Anders! I have yet to read Iron Gold, the fourth installment in the Red Rising Saga but I loved the first three books and, even if I don’t think the original trilogy needed more books, I’m attached to the characters enough to read the continuation of their story. 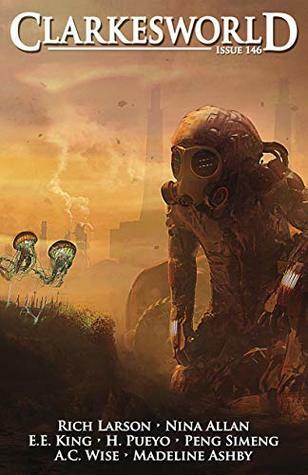 Broken Stars, edited by multi award-winning writer Ken Liu–translator of the bestselling and Hugo Award-winning novel The Three Body Problem by acclaimed Chinese author Cixin Liu–is his second thought-provoking anthology of Chinese short speculative fiction. Following Invisible Planets, Liu has now assembled the most comprehensive collection yet available in the English language, sure to thrill and gratify readers developing a taste and excitement for Chinese SF. This one has been everywhere lately and I want it! Not because it’s described as “an African Game of Thrones” but precisely because it doesn’t appear to be “another” Game of Thrones. It sounds very different from what’s already published and that’s why it’s appealing to me. And also, we are in 2019, can publishing companies stop comparing every single “grim” books to A Song of Ice and Fire please…? Every Winter, the human population hibernates. During those bitterly cold four months, the nation is a snow-draped landscape of desolate loneliness, devoid of human activity. Well, not quite. If I’m correct this was released last year in the UK and if it intrigued me then, it intrigues me even more now. Believe or not, I have never read a book by Fforde and this one might very well be my first one! It sounds very weird and right up my alley. The Haunting of Tram Car 015 returns to the alternate Cairo of Clark’s short fiction, where humans live and work alongside otherworldly beings; the Ministry of Alchemy, Enchantments and Supernatural Entities handles the issues that can arise between the magical and the mundane. Senior Agent Hamed al-Nasr shows his new partner Agent Onsi the ropes of investigation when they are called to subdue a dangerous, possessed tram car. What starts off as a simple matter of exorcism, however, becomes more complicated as the origins of the demon inside are revealed. I read and really enjoyed The Black God’s Drums by P. Djèlí Clark last year so I pre-ordered this one without even reading the synopsis. I’m glad I did because now that I know what’s it’s actually about, it sounds great! I definitely want to read a story about an alternate Cairo full of magical creatures! The Raven Tower is Leckie’s fantasy debut novel and if it’s as good as her science fiction, it’s going to be good! That’s enough for me to put this book pretty high in my “want list”. For many Americans, imagining a bright future has always been an act of resistance. 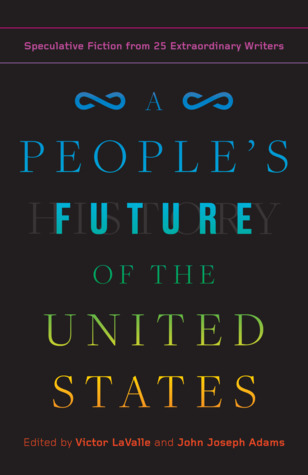 A People’s Future of the United States presents twenty-five never-before-published stories by a diverse group of writers, featuring voices both new and well-established. These stories imagine their characters fighting everything from government surveillance, to corporate cities, to climate change disasters, to nuclear wars. But fear not: A People’s Future also invites readers into visionary futures in which the country is shaped by justice, equity, and joy. It’s hard to categorize this one so I’m not going to. 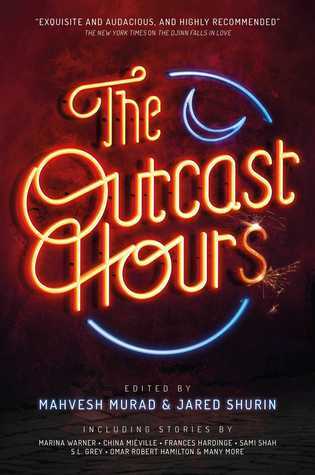 The author lineup of this anthology is amazing! To name just a few, it features Charlie Jane Anders, Sam J. Miller, Tobias S. Buckell, N.K. Jemisin, Omar El Akkad, Catherynne M. Valente, Seanan McGuire, Daniel José Older… OF COURSE I’M GOING TO READ THIS. This sounds freakin’ amazing! In my last post I mentionned that I was a bit burn out on science fiction and I’m pretty sure I know why. I didn’t read a lot of books last year and when I could squeeze in a bit of reading time, I concentrated my efforts on more complex and challenging books because I found those the most fascinating. That’s the way I am, I love to take on challenges, figure stuff out on my own and make the “most” out of my brain cells. I tend to get bored easily if I don’t have something to do! However, I’ve started the French equivalent of graduate school back in September (I study biological engineering) and, let’s just say that my brain cells have been working quite a bit since. If I look at my reading, September is the moment it started to dwindle. It took a while for me to figure out that making reading hard by concentrating most of my reading time on more complex reads wasn’t necessarily the best decision. It just turned my hobbie into more work on top of everything else. I realized that at the end of December when I couldn’t read more than a page or two each day. At the time I was reading The Last Good Man by Linda Nagata, a military science fiction that deals with a lot of darker themes. It’s an interesting book, well-written for sure and, because of that, I didn’t get why I couldn’t bring myself to read it. The answer is pretty obvious actually, a book can be great but the enjoyment of it is deeply linked to the timing of its reading. And forcing myself to read about wars, terrorist attacks and torture before/during finals wasn’t really the best idea! That’s why I decided that 2019 would be the year where I will try to be more conscious of the fact that reading is a way for me to relax and have fun. It’s not to say that I won’t read challenging books anymore because I definitely will but I want to find a good balance. To start this year on the right path, I decided to put very little pressure on myself and to read any work peaking my interest at the time. For now, it’s fantasy books and short fiction, I’ve read a lot of both in the past few weeks and I had a blast! Knowing myself, the science fiction novel break is not going to last that long anyway because it remains my favorite genre. Anyway, even if the start of the year has been a bit rocky, I liked all the things I read in January and I hope February is going to be even better! I liked everything this month but my two favorite things were the two short fiction magazines I read at the end of the month. I won’t review them on my blog but on Goodreads. I will do a Short Fiction Sunday post toward the end of the month mentionning my favorite stories overall, I think it might be more interesting than a post for each issue. As you can see, I’m following along the fantasy and short fiction theme! I’m going to try and catch up on my short fiction reading because I may or may have not subscribed to four magazines this year… I know it’s a bit crazy but it’s too hard to choose only one! However it also mean that I will probably drown under stories which is, to be honest, a good way to die. 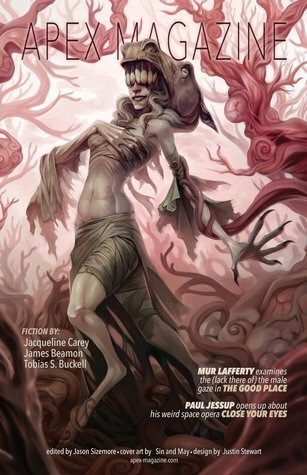 I’m now subscribed to Clarkesworld, Uncanny, Interzone and Apex so… you’ll be getting more Short Fiction Sundays this year!